CorHealth.com | Resources on the world of health and Joint Commission. Resources on the world of health and Joint Commission. Anti-vaxxers with their pseudo science are causing public health problems wherever they exist. Parents, themselves have been vaccinated, are no longer vaccinating their children. When generations emerged who have never seen the adverse and cataclysmic effects of disease, stupidity and privilege reign supreme. Worst worst part is the victims are always children (and sometimes the elderly). Children of uneducated parents who are susceptible to easily preventable diseases, and children who cannot be vaccinated (perhaps due to age). Unfortunately a change in the anti-vaccination movement won’t come until there is a widespread epidemic that will decimate children in small population counties. It’s eerie to consider that the “best” case scenario would be for outbreaks to be contained in highly religious or anti-science communities. But containment for infectious disease in highly populated areas is difficult. It’s only a matter of time before a lot of children get sick. 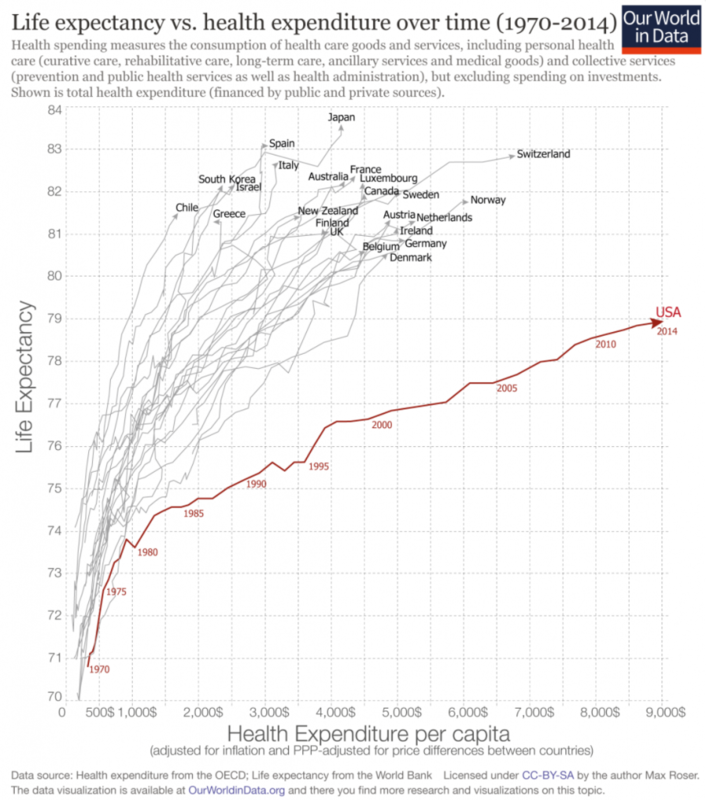 Despite spending almost double most developed economies per person (as a percentage of GDP), America’s healthcare system continues to operate in shambles. Spending continues to grow, reaching a staggering $3.5 trillion in 2017. This amidst tens of millions of Americans remaining uninsured, and many more millions unable to afford needed care. The American health system is a demonstrable demonstration of how a “free-market” health care program operates. It’s far more expensive for less coverage. Yet as a whole, America can’t seem to get a grip on a way forward. Many suffering from the ideology of anti-“socialism”, decrying any form of single payer system that would provide health coverage to all citizens. The same people are fine with trillions of dollars to the military, but struggle with “socialist” healthcare. The trouble with this approach is quite simple, Americans pay the most, yet the receive staggeringly less health care than any other developed nation on the face of the planet. We know that in all of the developed countries in the world, America pays the most money per capita yet receives worst coverage as a whole. Those who have healthcare coverage tend to see the doctor too many times, and those who do not have coverage never see the doctor. That has pushed America down in terms of standard of living. Here’s an interesting grout that depicts the level of healthcare coverage by state. The percentage figures are for the level of non compliance. Honestly, if we included some level of IT systems there would be further non compliance. Our sense is that is another place of weakness in many organizations. For the complete list visit JC. Firstly, all countries in this graph have followed an upward trajectory (life expectancy increased as health expenditure increased), but the U.S. stands out as an exception following a much flatter trajectory; gains in life expectancy from additional health spending in the U.S. were much smaller than in the other high-income countries, particularly since the mid-1980s. And secondly, the gains for all countries (except for the U.S.) were not diminishing, as in the previous graph. This suggests that there are many other factors affecting life expectancy, that are not determined by healthcare spending. Indeed, as we have pointed out before, healthcare is just one of many inputs to produce health. Source: Esteban Ortiz-Ospina and Max Roser, Financing Healthcare, 2017. Published online at OurWorldInData.org. Which products are the perpetrators on the crowded shelf? The most questionable claims and safety involve weight loss products, products to improve sexual performance, and body building products. Many of these so called natural supplements have been found to contain prescription drugs or steroids. Liver and kidney function, blood pressure can be adversely affected as well as the possibility of heart attack or stroke have been linked to the use of these supplements. Other dietary supplements have been found to contain contaminants such as pesticides, or heavy metals. FDA rules do not extend to the companies that provide the herbs or other materials that are manufactured in the US. The fine print on bottles of supplements can sometimes come with a disclaimer that the FDA has not verified the manufacturer’s claim. Protein drinks are a billion dollar product. Claims they advance are weight loss, energy boost, building muscle, and delay of aging. Let’s start this article with a riddle. What do more than 50% of Americans spend billions of dollars on yearly, and is the most popular alternative health therapy in the nation? If you answered dietary supplements instead of Disney World you are correct. What goes on behind the shelves and shelves of products with 1000 new ones being introduced annually? As you stand there deciding you need to know who and what is involved in the behind the scenes action. Often obscured by cryptic acronyms this article will reveal their true identity and purpose. The Joint Commission anticipates the new and revised National Patient Safety Goals will improve patient safety and quality of care by reducing morbidity and mortality, as well as health care costs and length of stays associated with CAUTIs. The R3 Report is available here.